Steampunk costumes call for spats! 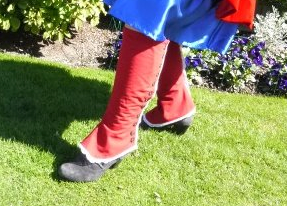 Or really great boots, which I don't have because of my gigantic ankles and calves. Anyone else have this problem? 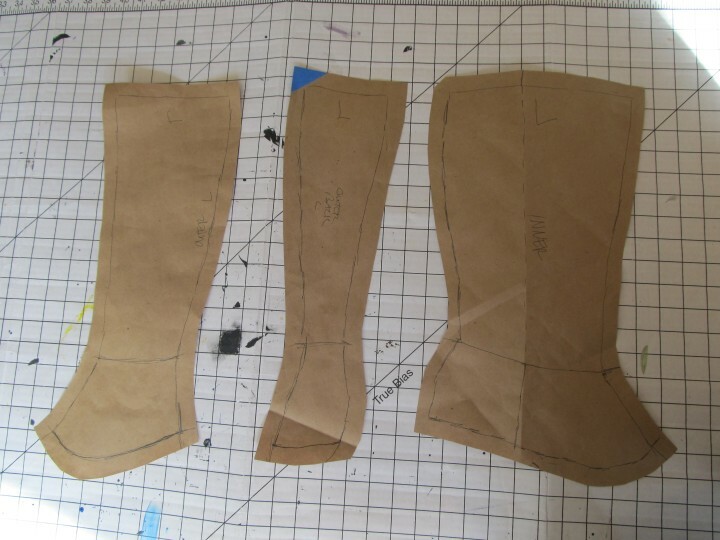 Anyway, To make spats (or gaiters), the first step is to make a pattern. To get the right fit, I created a duct tape "cast" of my foot following this DIY spats pattern guide. 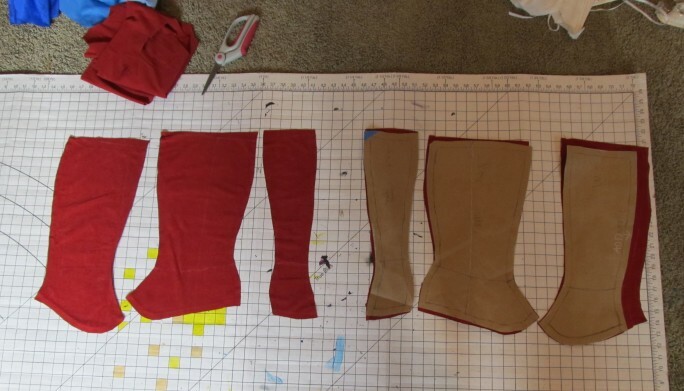 After I cut it off and cut it into three pattern pieces (inside, outside front, outside back), I discovered the sock I used was really contracting. I had to really spread out the duct tape pieces and pin them down in order to mark out the pattern pieces on butcher paper. I added 1/2-inch seam allowances and then belatedly remembered I needed extra width on the edge of the outer front piece (1) to overlap the outer back piece (2) and allow for button holes. 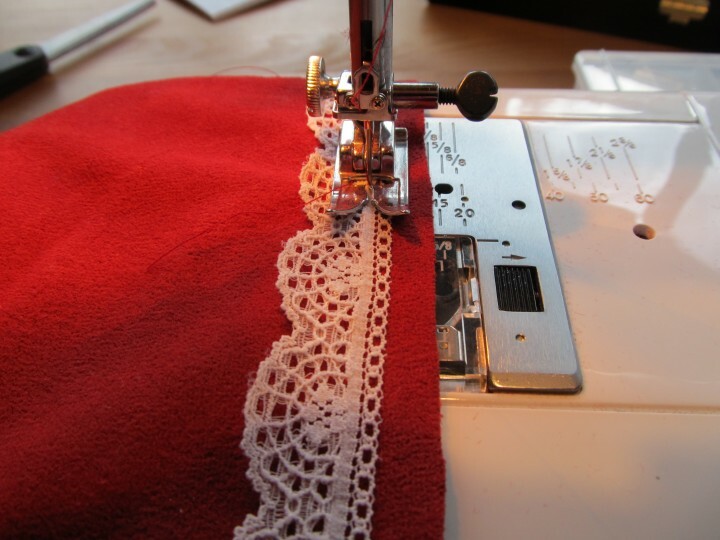 I accounted for this when I traced the patterns onto the fabric with chalk. I ended up with six pieces, three for each foot, mirror images of course. 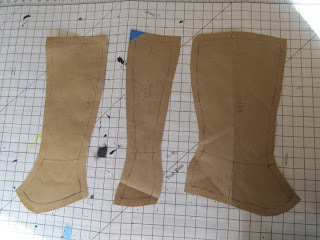 Then I sewed them together, sewing the two skinny pieces onto each side of the wider (inside) piece. Lastly I added buttons, twelve on each. I spaced out the buttons equidistant (about an inch) and marked the spots with a chalk line. Then I ran it through the buttonholer over and over, twenty-four times. I got really good at making button holes, I can tell ya that. 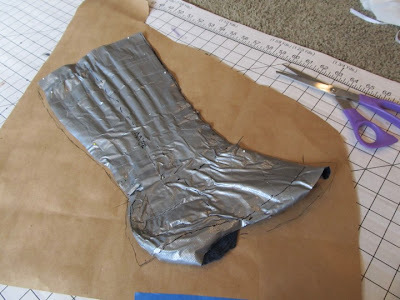 1) add a strap beneath the arch of the foot. I love your blog! Keep it up! I have my own blog too.